When machines rule, should humans object? Marking the beginning of a new era in astrophysics, scientists for the first time have detected gravitational waves and electromagnetic radiation, or light, from the same event. This historic discovery reveals the merger of two neutron stars, the dense cores of dead stars, and resolves debate over the origins of heavy elements such as platinum and gold. To achieve the result, thousands of scientists around the world used data from telescopes on the ground and in space. Researchers at the Harvard-Smithsonian Center for Astrophysics (CfA) played a pivotal role in the work. A series of eight papers by CfA astronomers and their colleagues details the aftermath of the event and examines clues about its origin. Hours after astronomers detected gravitational waves from neutron stars colliding on Aug. 17, the Harvard CfA team searched the sky as night fell in Chile using the Dark Energy Camera on the Blanco telescope, and within an hour located a new source of light in the host galaxy at a distance of about 130 million light years. The image above shows the source of light, between the yellow lines, dimming over 10 days. Gravitational waves, first predicted by Einstein’s general theory of relativity, are ripples in space-time caused by the accelerated motion of massive celestial objects. The Advanced Laser Interferometer Gravitational-Wave Observatory (LIGO) made the first direct detection of gravitational waves in September 2015, when the merger of two stellar-mass black holes was discovered. That work was honored earlier this month with the Nobel Prize in physics. At 8:41 a.m. this past Aug. 17, LIGO scientists detected a new gravitational wave source, naming it GW170817 to mark the discovery date. Just two seconds later, NASA’s Fermi satellite detected a weak pulse of gamma rays from the same location in the sky. Later that morning, LIGO announced that two merging neutron stars produced the gravitational waves from GW170817. A simulation of the gravitational waves detected by LIGO on Aug. 17. Gravitational waves are ripples in space-time caused by the accelerated motion of massive celestial objects, such as merging neutron stars. A few hours after the announcement, as night set in Chile, Berger’s team used the powerful Dark Energy Camera on the Blanco telescope to search the region of sky from which the gravitational waves emanated. 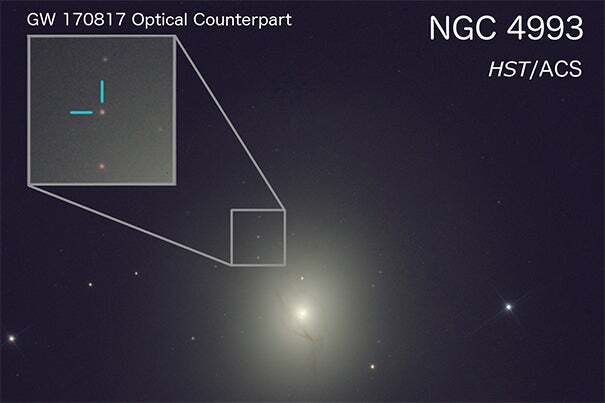 In less than an hour they located a new source of visible light in the galaxy NGC 4993 at a distance of about 130 million light-years. Several teams of astronomers, including Berger’s CfA group, scrambled to capture as many details as possible from the rapidly fading neutron star collision, known as a kilonova. “The plan was simple: capture every single photo of light from this event to uncover all of its detailed physical processes,” Berger said. From their measurements, astronomers were able to detect “the direct fingerprints of the heaviest elements in the periodic table,” in amounts totaling some 16,000 times the mass of Earth. “As this material is flying out from the site of the two neutron stars merging, it will eventually combine with other material to form stars, planets, life, and jewelry,” Berger said. The neutron stars themselves, he said, were formed in supernova explosions when the universe was just 2 billion years old and spent the last 11 billion years spiraling in decaying orbit around each other. Supernova explosions like the one that produced the neutron stars are known to create lighter elements, such as iron and nickel. Watching the neutron star collision, scientists were able to see the source of the heavier elements in the periodic table, such as gold, platinum, and uranium. “In this one system, we see the complete history of how the periodic table of the elements came into being,” Berger said. Radio observations with the Very Large Array in New Mexico helped confirm that the merger of the two neutron stars triggered a short gamma-ray burst (GRB), a brief burst of gamma rays in a jet of high-energy particles. The properties match those predicted by theoretical models of a short GRB that was viewed with the jet initially pointing at a large angle away from Earth. Combining the radio data with observations from NASA’s Chandra X-ray Observatory shows that the jet pointed about 30 degrees away from the planet. Many observatories were used to study the kilonova, including the SOAR and Magellan telescopes, the Hubble Space Telescope, the Dark Energy Camera on the Blanco, and the Gemini-South telescope. The series of eight papers describing the results were published in The Astrophysical Journal Letters on Monday. The four papers with first authors from CfA are on the changes with time of light from the kilonova (Cowperthwaite); the changes with time of the kilonova’s spectrum (Nicholl); the Very Large Array observations (Alexander); and how long the merger took to unfold and the properties of the host galaxy (Peter Blanchard). Also, Marcelle Soares-Santos of Brandeis University led a paper about the discovery of the optical counterpart; Ryan Chornock from Ohio University led a paper about the kilonova’s infrared spectra; Raffaella Margutti from Northwestern University led a paper about the Chandra observations of the jet; and Wen-fai Fong, also from Northwestern, led a paper about the comparison between GW170817 and previous short GRBs. Harvard Gazette science writer Alvin Powell contributed to this report. Panelists Jonathan Zittrain, (from left), Cynthia Dwork, Margo Seltzer and Christopher Griffin discussed the impact of AI on society and how to regulate it at the Harvard kickoff to HUBweek.